This article is to answer some of the Frequently asked questions on SharePoint developer dashboard. What is Developer Dashboard in SharePoint? The developer dashboard is a new feature introduced in SharePoint 2010 to monitor and debug the performance on page by page basis. Remember the old days, when it was too difficult in MOSS 2007 on troubleshooting page delays? Developer dashboard is the answer to them! What Information it gives to debug and troubleshoot? All operations and its start-end time, Controls and their load time, total execution time, current user, SPRequests, URL, Current page checkout level, current operations being performed, Call Stacks, Web Server, Critical Events, Database Queries and their execution time, Service Calls, execution time, Events fired during the page rendering, Order of the page lifecycle and time during each stage, etc. How to Activate SharePoint developer dashboard? On - Turns On Developer Dashboard all time at the end of the page content. OnDemand - You will be able to show or hide the developer dashboard by clicking the image button next to your login name on the page. site collection administrator can toggle it ON or OFF. How to I Launch Developer Dashboard? once its turned ON every page will have the developer dashboard in its bottom. If its set to "OnDemand", developer dashboard can be launched by clicking the image button next to your login name on the page. How to Hide or Disable SharePoint Developer Dashboard? Any of the above methods like stsadm can be used. If its is set to on demand, site collection admins can turn it on or off. When they do, it only turns it on or off for that particular site collection. Also, only the person who turned it on sees the output. Other users will not see the output. How do I monitor my own function with developer dashboard? "Your-Function-Name" will appear in the developer dashboard!. BTW, SPMonitoredScope isn't accessible in the Sandbox solutions. Does it available in SharePoint 2010 foundation? 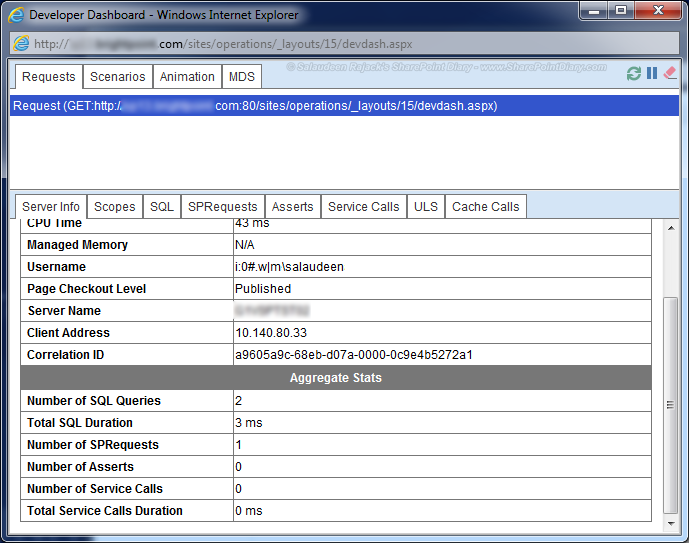 Yes, developer dashboard is available in SharePoint 2010 Foundation as well. All of the above methods work for SharePoint 2013 also! SharePoint 2013 developer dashboard brings new features such as: ULS logs Tab, Opening in new window, MDS Tab, SPRequests tab to debug Object dispose bugs, View all requests, etc. Ondemand option is deprecated in SharePoint 2013. SharePoint 2013 developer dashboard relies on Usage and Health Data Collection Service Application. So, Create it first! New-SPUsageApplication -Name "Health and Usage Application" -DatabaseName "SP2013_Health_and_Usage_Srv"
If you don't do it prior enabling: you will get developer dashboard in SharePoint 2013 empty! 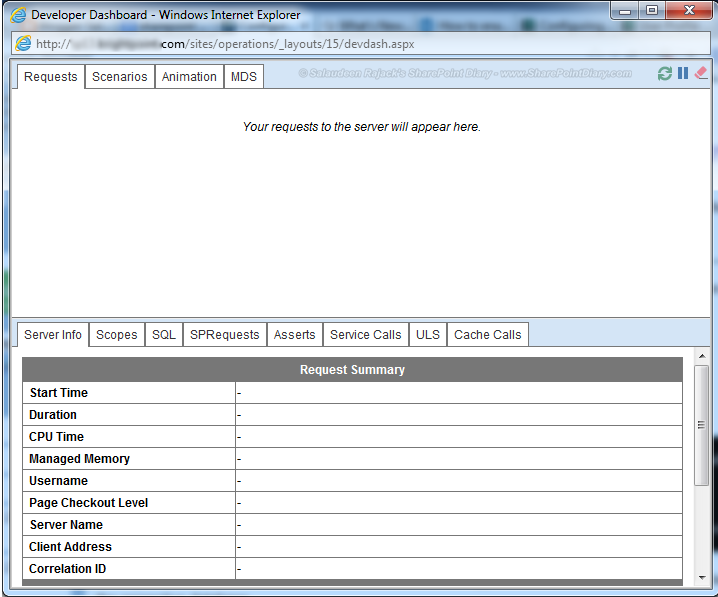 Wictor Wilén has created a Feature based solution to Turn ON/OFF Developer dashboard from Central Administration site. What Permission we need to run SharePoint developer dashboard? By default, You need "AddAndCustomizePages". But you can set the "RequiredPermissions" property to base permissions to override. 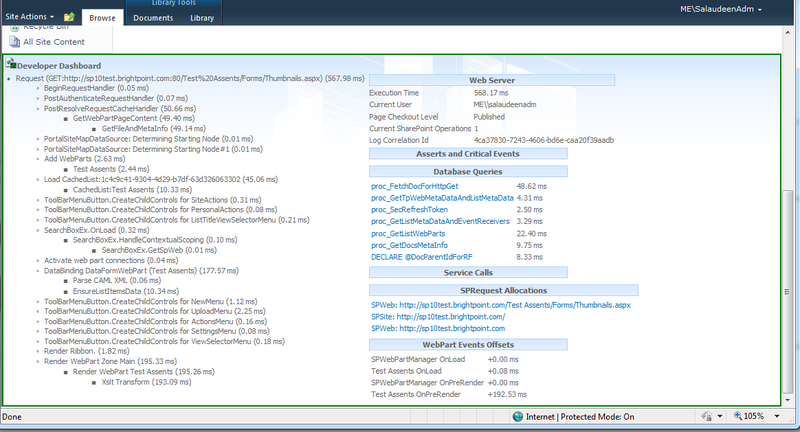 It comes into save while problem solving performance issues of the SharePoint Page.